Trending at $22.08Trending price is based on prices over last 90 days. New ListingElite Cuisine 11” Quesadilla Maker Makes 6 atva time New in box. Trending at $19.48Trending price is based on prices over last 90 days. 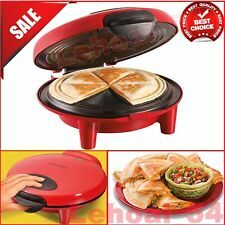 NEW - Crofton Quesadilla Maker, Red, Non-Stick ! Trending at $20.80Trending price is based on prices over last 90 days. Brentwood Red Electric Quesadilla Maker - NEW in the Box! Hamilton Beach 25409 Quesadilla Maker NEW! !